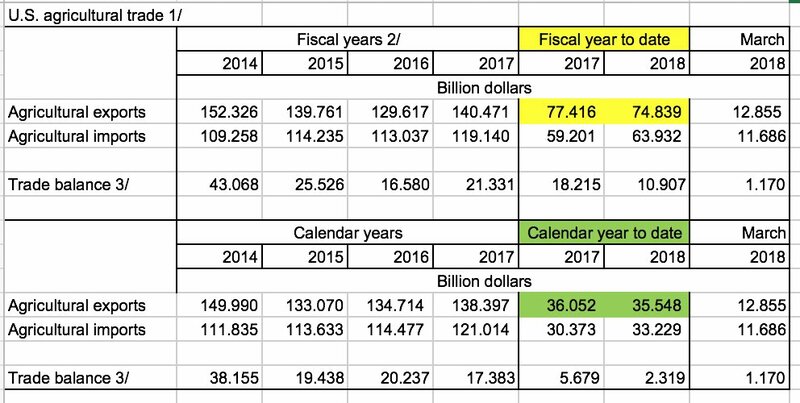 Late last week, the U.S. Department of Agriculture released updated agricultural trade data for the first half of this fiscal year (October – March). Meanwhile, President Trump sent members of his senior economic team to China for trade negotiations, but those talks ended Friday, “with no deal and no date set for further talks.” Since April, China has canceled and curtailed purchases of key Corn Belt commodities. Today’s update highlights recent news items that explore these developments in greater detail. Gary Crawford reported on Friday at USDA radio, “We now have the complete ag trade figures for the first half of this fiscal year, taking us from October through March,” before much of the current trade row between the U.S. and China unfolded. 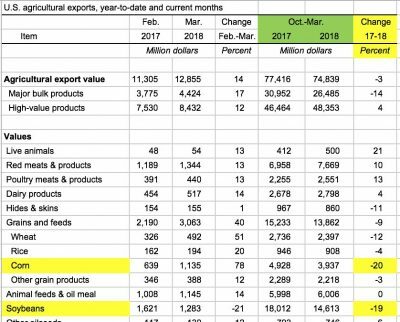 The data showed that the U.S. exported $12.9 billion worth of ag products during March. However, Mr. Cooke noted in the radio segment that, compared to fiscal year 2017, exports were down three percent for the first half of fiscal year 2018. The radio report pointed out that USDA will issue its latest trade outlook on May 31st. A separate USDA radio report on Friday explained that bulk ag commodities sales were down 14 percent in the first half of the fiscal year, while high value ag exports were up four percent. 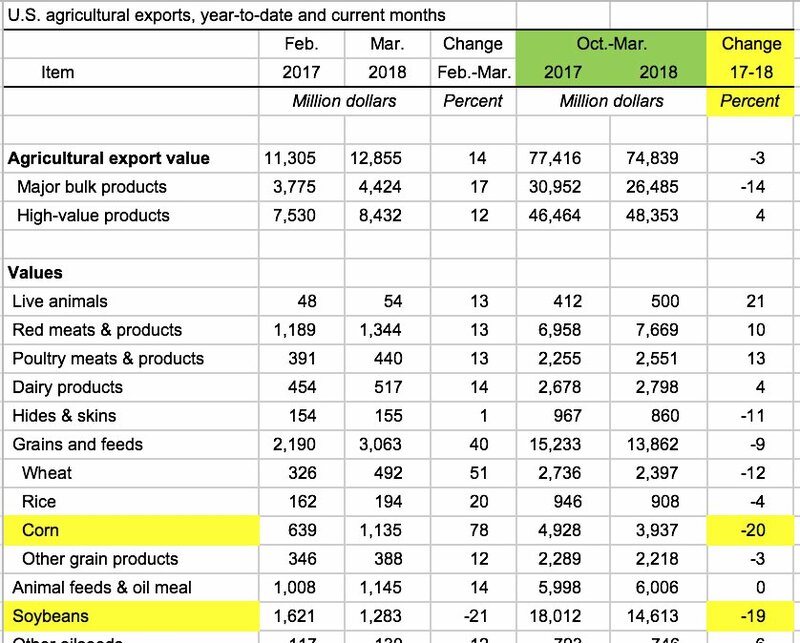 Compared to last year, the value of corn exports were down 20 percent, the value of soybean exports declined 19 percent, and wheat sales were down 12 percent. 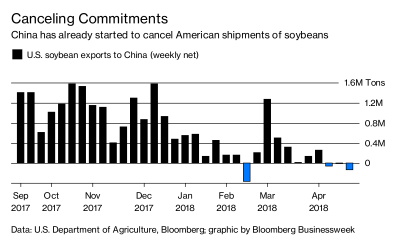 “Since early April, when China announced tariffs on some U.S. agricultural goods and threatened to target others, Chinese importers have canceled purchases of corn and cut orders for pork while dramatically reducing new soybean purchases, according to U.S. Department of Agriculture data. Chinese importers’ new orders of sorghum, a grain used in animal feed, have dwindled while cancellations increased. “China Is Already Canceling U.S. Soybean Orders,” by Alfred Cang, Megan Durisin, and Mario Parker. Bloomberg News (May 4, 2018). “China is expected to import 96 million tonnes of soybeans in the 2017/18 year, according to official numbers, versus domestic production of 14.6 million tonnes. “But the official efforts to increase domestic production underline Beijing’s concerns about the impact of the tariffs,” the article noted. Meanwhile, Lingling Wei reported on the front page of Saturday’s Wall Street Journal that, “The U.S. and China asked one another to make sweeping concessions in trade talks, failing to bridge sharp divisions and raising the chances that each government will slap tariffs on tens of billions of dollars of the other country’s exports. “U.S. soybean sales to China over the last four weeks are down 10 percent from a year ago, according to U.S. trade figures. This is a blow to farm country, which helped boost President Donald Trump into office in the 2016 election,” the article said.